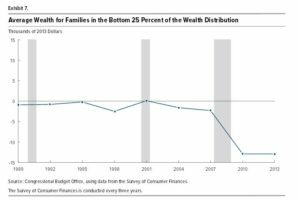 A new report [PDF] by the Congressional Budget Office (CBO) looks at changes in household wealth from 1989 through 2013. The report finds, “The distribution of wealth was more unequal in 2013 than it had been in 1989.” The bottom half of the population lost wealth over the period, while other groups gained. 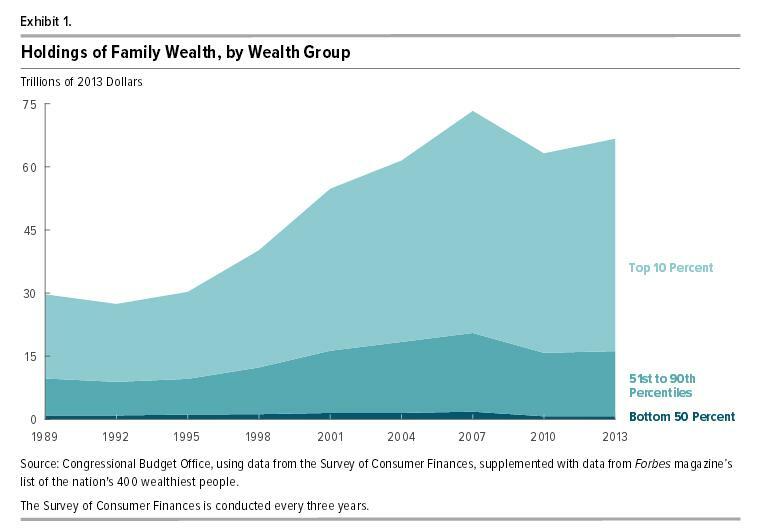 The higher the wealth in 1989, the greater the gains to 2013. Wealth distribution has become more unequal over time. All wealth groups including the top ten percent lost wealth since 2007, the year before “the great recession.” The report does not look at the top one percent independently. The report also looks at changes in wealth since 1989 for families with heads of households at different ages, and for those with different levels of education. Here too, results varied widely. 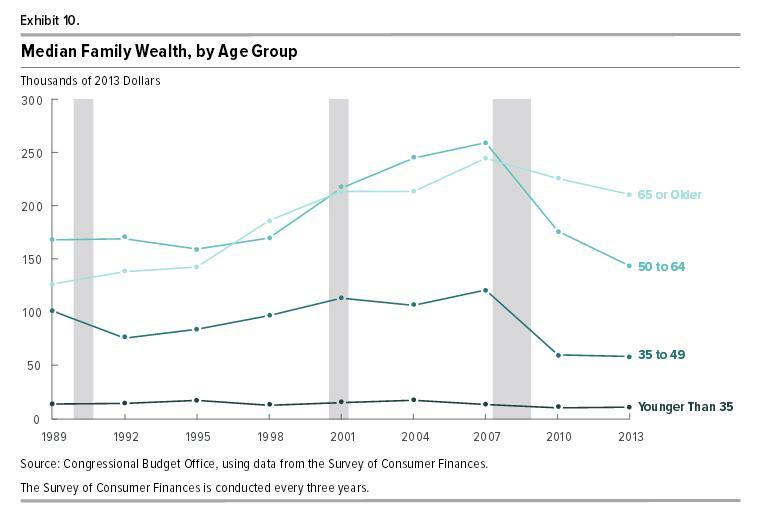 Families with heads of households of all ages lost wealth, except those over age 65. Groups aged 35 to 64 gained ground until 2007, but slipped dramatically since then — losing all of the gains and then some. Wealth of younger people budged just a little throughout the entire period. 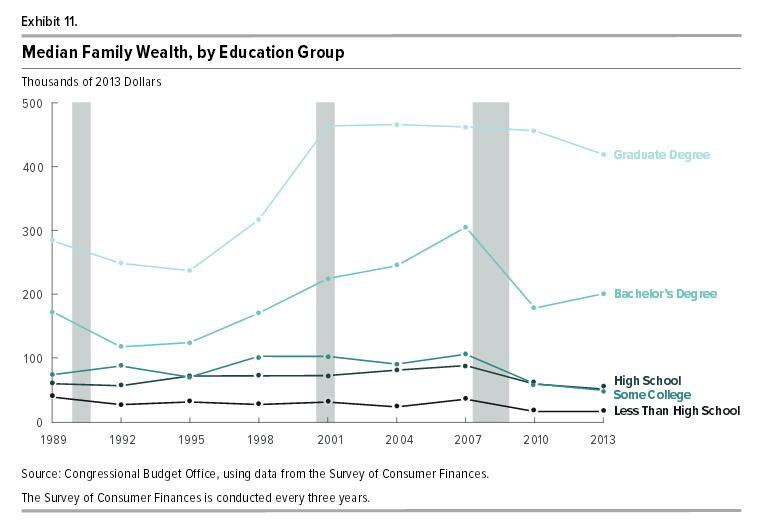 From 1989 through 2007, wealth levels increased for those with a high school education or better. During this period, the higher the education level, the greater the gains. For those with less than a high school degree, wealth remained steady. Education matters. After 2007, all education groups lost ground, with the high school degree crowd ending up lower than they had been in 1989. Estimates based on data from the Survey of Consumer Finances (SCF), supplemented with data on the nation’s 400 wealthiest families, suggest that the share of wealth held by those in the top 1 percent increased by 6 percentage points—from 31 percent to 37 percent—between 1989 and 2013. By contrast, estimates based on other data and methodologies suggest that the share of wealth held by the top 1 percent increased by 14 percentage points—from 28 percent to 42 percent—between 1989 and 2012. 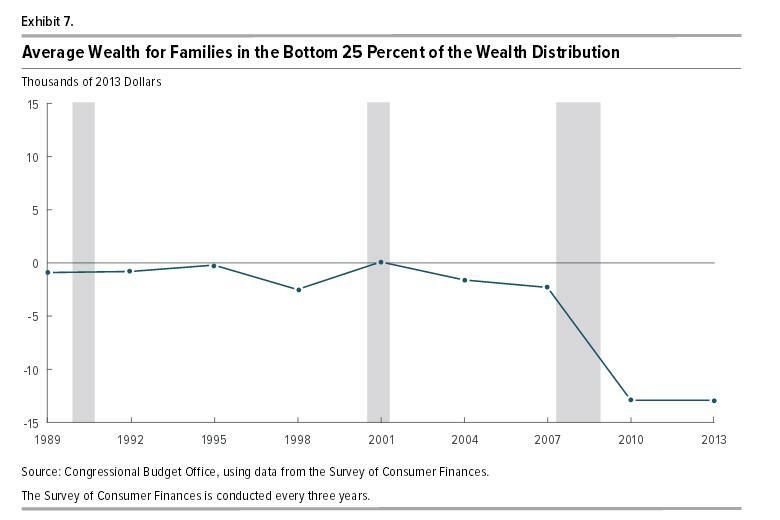 For this analysis, CBO calculated that measure of wealth as a family’s assets minus its debt. CBO measured wealth as marketable wealth, which consists of assets that are easily tradable and that have value even after the death of their owner. Those assets include home equity, other real estate (net of real estate loans), financial securities, bank deposits, defined contribution pension accounts, and business equity. Debt is nonmortgage debt, including credit card debt, auto loans, and student loans, for example. The report is 20 pages long with a dozen graphical illustrations and can be found here [PDF].